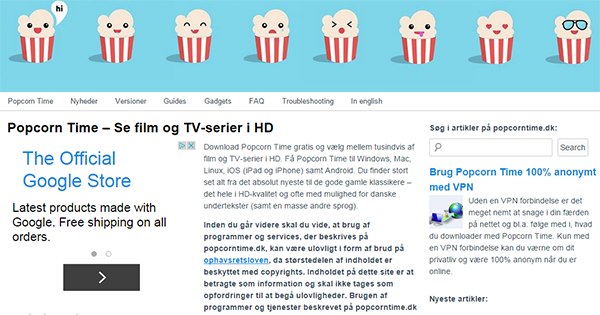 Police in Denmark have arrested the alleged operators of two Popcorn Time guide websites. The domains of both operations have also been seized by the authorities. The case is controversial in that both sites were Popcorn Time information resources and neither linked to copyright-infringing material. More than a year after its 2014 launch and the popularity of the now famous Popcorn Time video streaming application is showing no signs of fading away. However, since millions of people use the various forks of the software every day, Popcorn Time is increasingly attracting the attention of copyright holders, anti-piracy groups and law enforcement agencies. While neither of the main forks have yet been targeted, others around them are feeling the heat. In fact, the latest news coming out of Denmark suggests that the authorities are even prepared to hit those barely on the perimeter. Following a court order dated June, local police report that yesterday morning they arrested two men in their thirties said to be the operators of a pair of Popcorn Time related websites. Popcorntime.dk and Popcorn-time.dk have now been shut down, with their domains placed under the control of the state prosecutor. “The Danish State Prosecutor for Serious Economic and International Crime is presently conducting a criminal investigation that involves this domain name,” reads the seizure notice. While arrests of file-sharers and those running sites that closely facilitate infringement are nothing new, this week’s arrests appear to go way beyond anything seen before. The two men are not connected to the development of Popcorn Time and have not been offering copyrighted content for download. Both sites were information resources, offering recent news on Popcorn Time related developments, guides, FAQ sections and tips on how to use the software. The screenshot below shows PopcornTime.dk. Those looking for a clearer (and live) idea of what the site looked like before it was taken down should check out getpopcorntime.co.uk, which was previously promoted by PopcornTime.dk as an English language version of their site. Importantly, neither site hosted the Popcorn Time software, instead choosing to link to other sites where the application could be downloaded instead. Nevertheless, this doesn’t appear to have saved them from the Danish authorities. Both men stand accused of distributing knowledge and guides on how to obtain illegal content online and are reported to have confessed. In fact, according to court documents the pair are suspected of such gross violations of copyright law that they could warrant punishment under section 299b of the penal code – offenses which carry a maximum prison term of six years. Inspector Michael Hellensberg from the Danish police Fraud Squad told local media that the case is a significant one in a number of respects. “The case is important because, firstly, it shows that [site operators] can be revealed by the police. This has consequences and it also conveys the message that this behavior is illegal,” Hellensberg said. Earlier this year, six websites setup as Popcorn Time “fan pages” were shut down by anti-piracy outfit BREIN. None were affiliated with the official project and all reached a financial settlement with the group.